You know what Boston needs more of? Establishments where ordering your beer in a comically large novelty glass is a viable option. So when the Yard House (henceforth to be read as “Yaaaaahhd House”) arrived in Fenway, we were jazzed. The world’s largest menu? Check. Full two pages of beers? Double check. And the ability to order beers by distance instead of volume? Sign us up! Adding to the excitement, the night that we attended was “Harpoon Rare Beer Night”, allowing us to sample all sorts of magical concoctions that we hope will soon make it to bars on a regular basis (Bacon Bock, anyone?). To pad our beer we ordered the Yard House chicken nachos, with spicy pinto beans, cheddar, jack, red & green sauce, tomato, cilantro, onions, guacamole and sour cream. 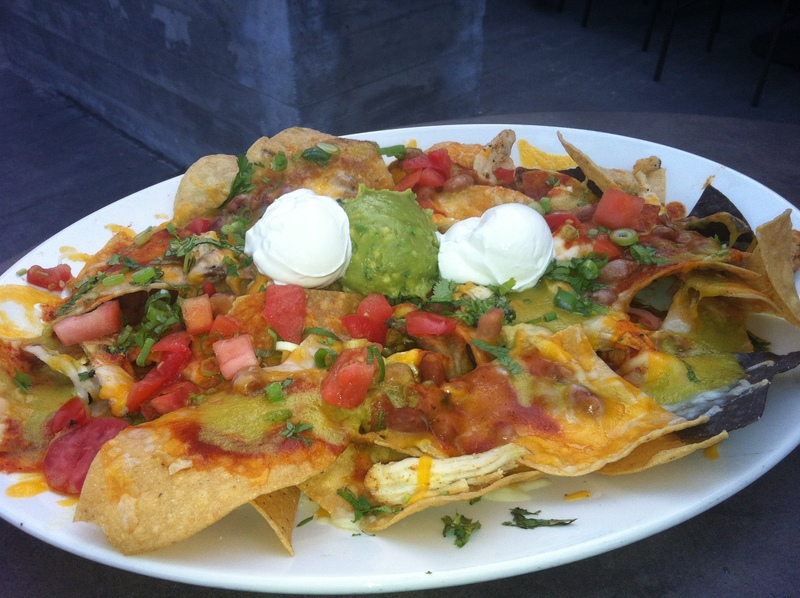 Appearance: (8) First off, what is it with chain restaurants and flat nachos? See Pizzeria Uno. Very pretty, with lots of nice colors. We were a little perplexed by the ~3 blue corn chips that we saw on the plate– were those intentional or did they sneak in from somewhere else in the kitchen? And, #thingswenormallyaskduringlobsternight, what is that green stuff? Quality of Ingredients: (8) The green stuff turned out to be green chile sauce, which was quite tasty and something we haven’t seen on nachos in a while. We greatly enjoyed the pinto beans, and found the chunks of chicken to be rather well seasoned and not too dry. While it tasted OK, the guac was definitely not homemade. Distribution of Toppings: (7) Flat nachos have their benefits, including a generally equitable distribution of toppings. These were no exception, and the full coverage was also aided by the viscous chile sauces and saucy pinto beans. However, these nachos deteriorated quickly upon reaching the table. You know how on some lucky occasions the nachos arrive at your table with sizzling and boiling cheese? This was not one of those times. The cheese was on its way to congealing when we got them and continued on that path. The chips on the bottom, and those exposed to a lot of chile sauce, turned quite floppy. Perhaps Yard House should look into the Vito’s Tavern black bean scaffolding approach to distribution? Price: (7) $11 and easily demolished by two as a reasonable dinner. Overall: 30/40. Another solid addition to the Fenway nacho roster. We would highly recommend a visit, if not for the nachos, to gawk at the massive menu and epic beer list. Thanks for including us in your tour, we’re glad you were able to make a visit to us on a special night. We’re happy to hear you enjoyed the nachos and appreciate your feedback, we will be sure to send your thoughts to our chef. 🙂 Cheers!